Callin’ out around the world, are you ready for something great to eat? Summer’s here and the time is right for grillin’ on your street. My apologies to Martha & The Vandellas, but it’s just too hard to hide my excitement about ‘cue’ing up some summer produce. Are you excited too? Well if not, you should be, because things taste great and the produce is ready to go! Plus, most produce should be at its best price now, which makes it a double bonus. Choose an assortment of your favorite organic fresh summer produce: peaches, plums, avocado, corn, and cantaloupe are a good place to start. And with the selection changing throughout the summer, don’t be afraid to mix and match what’s in season. Also, remember – if you want to bring out the natural sweetness of fruit, as well as add a subtle smoky flavor, then summer grilling is the way to go! Choose firm, unblemished fruit that is not quite ripe, but still yielding to the touch. Be sure to brush the grill clean. Keep a close eye on the fruit, as their natural sugars can cause them to burn quickly if left unattended. Serve grilled fruit while still slightly warm to fully capture the flavor of the fruit. If you’re grilling a bunch, you can refresh it with a squeeze of citrus juice and a grating of zest after the fruit is cooked. Let’s start with my favorite fruit: PEACHES! They are good right now and will only get better as the summer strolls along. Cut them into ½ inch slices, brush with a little organic canola oil and grill about two minutes on each side, or just until fork tender. Remove and spoon the grilled peach slices onto a scoop of vanilla ice cream. Once your friends taste this treat, there won’t be any sound except “mmmm,” “aahhhhh,” and of course “is there any more?” coming from your delighted guests. Make sure it’s organic if you want to avoid GMO’s, as conventional sweet corn is very likely GMO with its approval and planting in the past couple of years. Remove large husks (outer ones). Turn back inner husks and remove the silk. Pull inner husks back over ears and soak in cold water for about 1 hour. Remove ears and shake excess water off. Place ears on grill about 4-5 inches above hot coals. Turn frequently and cook for 15-30 minutes or until tender. No? Oh my goodness! Mm-mm it is a delightful treat! The trick to grilling melon is to do it hot and fast. Let’s try some cantaloupe! You only need a minute or two with this recipe. Preheat your grill. Cut cantaloupe in half and remove the seeds, then cut into ½ inch rounds and slices. Combine honey, butter, cinnamon, and brown sugar in a saucepan. Once melted, brush mixture onto cantaloupe. 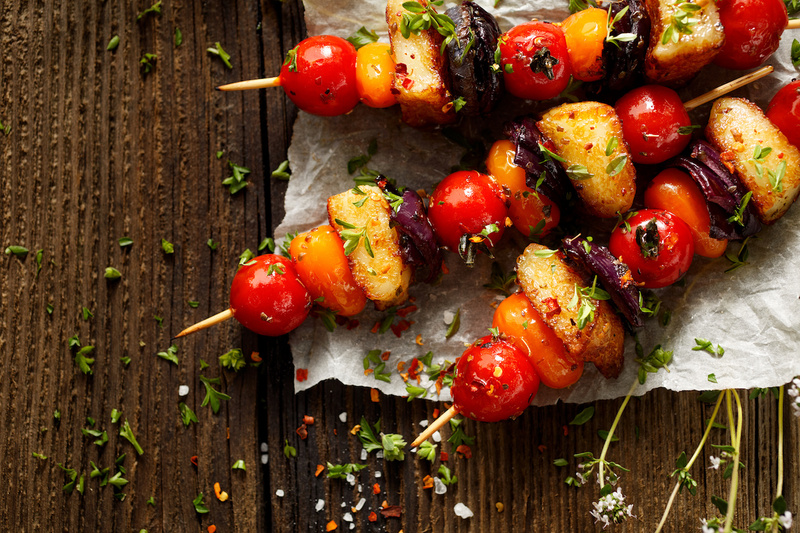 Place skewers on a lightly oiled grate and cook over high heat for 1-2 minutes. This can be served with sorbet or ice cream and topped with any remaining honey-butter sauce. Cut avocado in half and remove seed. Drizzle with fresh lime or lemon juice and brush lightly with olive oil. Gently place cut side down on grill over hot coals for 2-3 minutes. Season with salt to taste. Once you’ve grilled them, put them into organic corn tortillas that have been warmed on the grill, sprinkle with a little feta, and top with a big fat slice of your favorite summer tomato! One bite and you’ll find you’ve wowed even your biggest summer grilling skeptic. There is almost nothing you can’t grill so get to it! I’m gonna go eat! An Organic Conversation is the preeminent site on the web for those wanting to live an organic lifestyle. Through thoughtful and informative journalism, we hope to enrich your health and your lives while helping to protect the planet. An Organic Conversation also has a weekly podcast and radio show that features lifestyle segments to inspire health, sustainability, and mindfulness through interviews with authors, filmmakers, non-profits, and changemakers. Hosted by Ecologist and Organic Food Advocate Helge Hellberg. Organic vs. Non-Organic Wine: What’s Really in Your Glass?